Devastating wildfires have been burning across large areas of Australia and Tasmania for several weeks. The Copernicus Atmosphere Monitoring Service (CAMS), implemented by the European Centre for Medium-Range Weather Forecasts (ECMWF) on behalf of the European Union, monitors emissions from such wildfires in order to estimate how dangerous they may be in terms of atmospheric pollution. This January has been the warmest on record in Australia, and one of the driest compared to the 1981-2010 average. In addition, the country has suffered from record-breaking heatwaves. 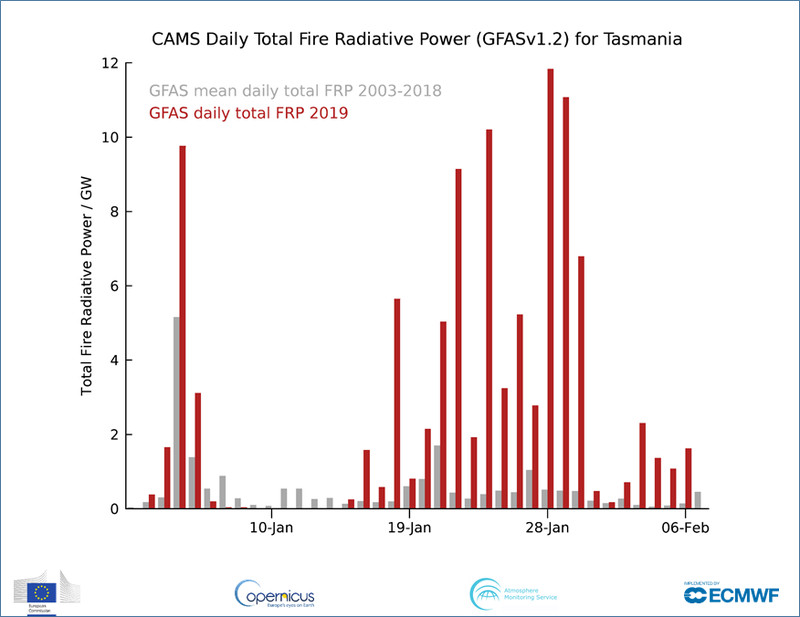 Throughout January, rainfall was below average for Australia as a whole; and the daily total Fire Radiative Power (FRP), a measure of heat output from wildfires, was much higher than usual for Western Australia. 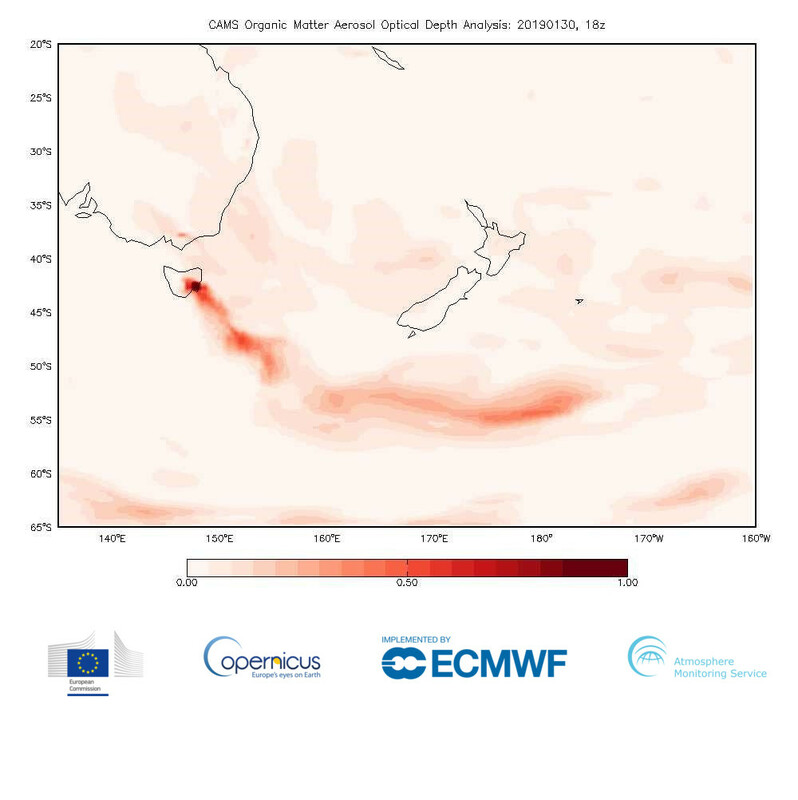 For several weeks from mid-January Tasmania experienced numerous fires with smoke plumes visible in satellite images crossing the Tasman Sea as far as New Zealand and beyond. 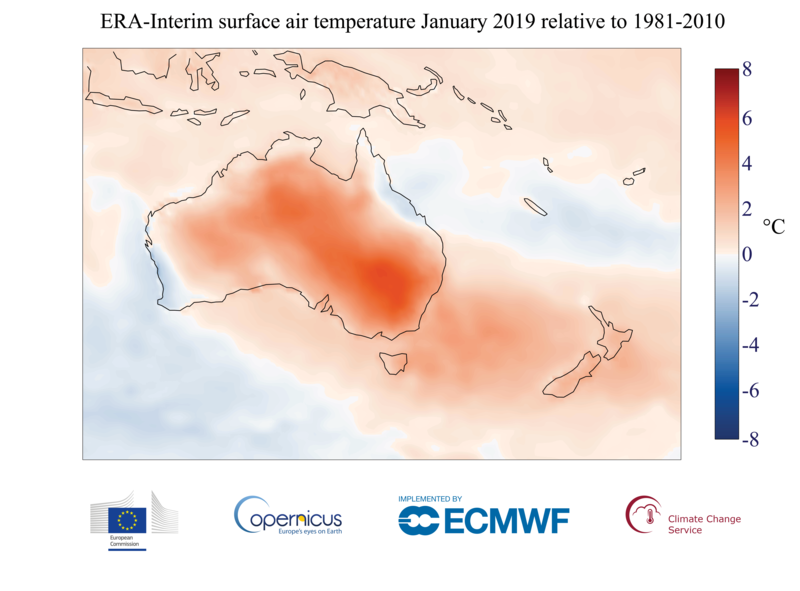 Although Tasmania avoided the extreme heat of mainland Australia, it still endured its warmest and driest January on record. Throughout the month, the Fire Weather Index, which takes into account numerous variables, including wind speed and precipitation, showed large areas of concern. Levels remained at moderate to extreme for the whole month across much of the state, and ignition sources such as dry lightning led to numerous bushfires, exacerbated by their remote locations and periods of strong winds. The island state experienced ongoing devastation and threat of fire for many days, clearly shown in the chart below, which compares the daily total FRP throughout the month with the 2003-2018 average daily total for the same dates. Fire forecasting can be complicated, as there are many variables to take into consideration. For example, regions which are experiencing drought, low humidity and high wind speed score highly on the Fire Weather Index. However, there is no global system providing associated information on vegetation; if there is no fuel, there can be no fire. Currently, local knowledge helps identify regions at risk. Australia is relatively isolated, so the effects have only been felt locally. However, smoke plumes from wildfires in other areas of the globe, such as Siberia, have been seen to spread across the globe. More information can be found through the CAMS Global Fire Assimilation System (GFAS) webpage. Next Post IS IT ALREADY TOO LATE?